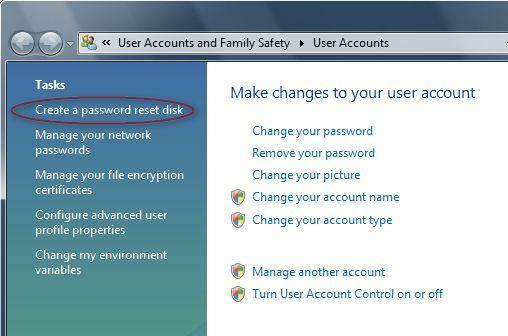 After you install Windows Vista on your PC or you change the password of your user account, it is a good idea to create a password reset disk. This disk will be of great help if you forget your password for some reason. 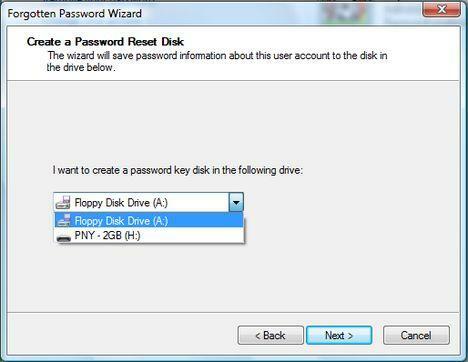 In this tutorial we will show you how to create such a disk and how to reset your password when needed. In the Start Menu search box type the word "user". One of the displayed results will be User Accounts. Click on it and the User Accounts Panel will open. 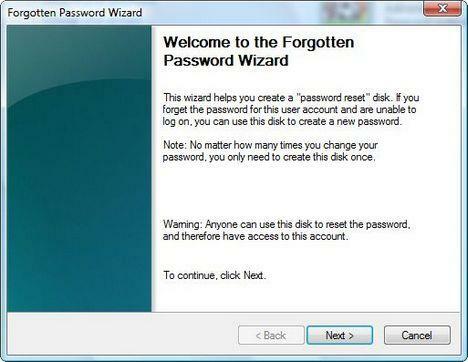 The Forgotten Password Wizard will open. Insert a storage device where your password reset information will be stored. NOTE: You can use a floppy disk or a USB memory stick. Other types of storage might work as well. Unfortunately, we did not have any other available for testing at the time when we wrote this article. After you have insterted the storage device click on the Next button. 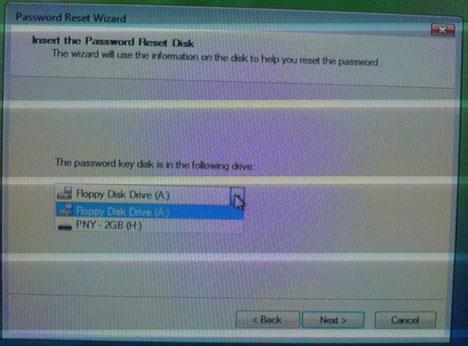 Select the drive you want to use for the password reset disk and press Next. Type your current user account password and click on Next. 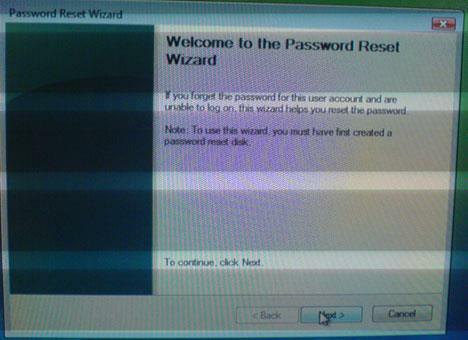 The password reset disk will be created. Wait for a while and click on Finish after the disk has been successfully created. When you are in the login screen, if you type an incorrect password, you will receive the error message shown in the screenshot below. Click on OK and now the Reset password link appears just beneath the Password field. 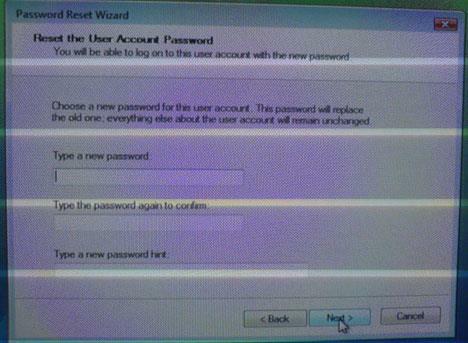 Click on it, and the Password Reset Wizard will start. Insert the password reset disk and click on Next. Choose the drive letter where you inserted the reset password disk and press Next. Now you have to type a new password and a password hint. When finished, click on Next. 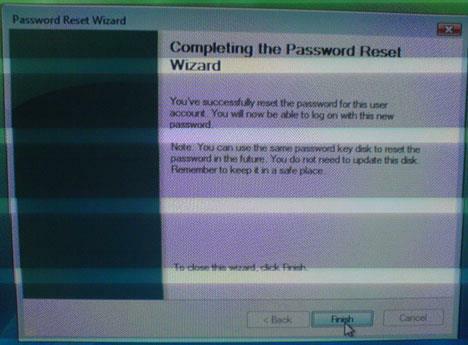 The wizard will give you the confirmation that the password of your user account was successfully reset. Click on Finish and then login using the new password. 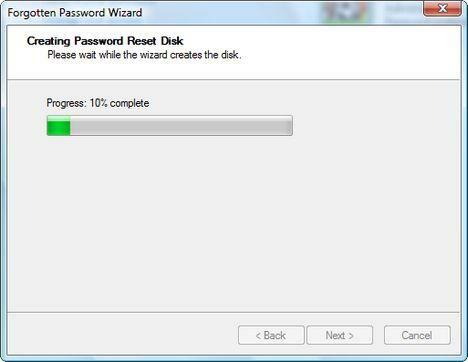 If you want to use the reset disk again, just in case you will forget your password in the future, you should format it and go through the creation wizard again. NOTE: if you forgot your password and you don't have a password reset disk, you will need to use 3rd party tool such as Active Password Changer to crack your password and change it to something else. I think it would be better to use the Active Password Changer. Can this process be used in another laptop? My friend gave his laptop to his brother, but he forgot his password so what i did i create a password reset disk in my own laptop, but im not sure if this will for on his laptop to reset password. Please advise. No, it won't work. You can retrieve the password for your computer, your user only. Not for other computers & users. 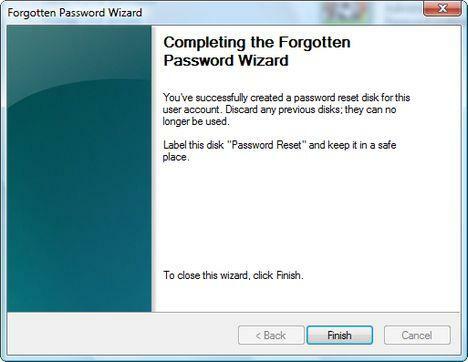 How to retrieve your Windows Vista password. How do you access vista when you have forgotten your password and don't have a password disc. I'm with this guy! I need to know how to get past the Vista logon screen without a password. I bought the display model at Costco and, at some point, someone set up a user and password. No one at the store knows the user or the password, and now I'm stuck with a $900 paper weight. All the "solutions" I see on the web tell me to "change the password", but any idiot knows that you have to actually KNOW the existing password in order to get into Vista to CHANGE the password. I saw somewhere that you can remove the battery from the motherboard for a few seconds and clear out the BIOS settings. I'm not convinced that will work, but at this point, I'll try anything. If you forgot your password and you don't have a password reset disk, you will need to use 3rd party tool such as Active Password Changer to crack your password and change it to something else. That thing you described, with the BIOS, will never work. That will only reset the BIOS settings, not the Windows Vista passwords. just reformat. Use the license on the bottom of the machine and use any mediaa disc of the version of vista you have a license for and put the disc in and delete the partition with windows on it and repartition new and reformat and install vista over again. end of paper wieght.. new laptop ready. How do you access vista when you have forgotten your password and don't have a recovery password disc? Please help. Please read the note at the end of the article. I can not install the demo program as I need the admin password in order to install any new programs. Very little. Something under 1 MB. great tutorial! but it could have been more understandable if you had use the CTRL+PRINT SCREEN key for a much clearer view instead of using an external camera. specialy for a guy like me who is 73 yrs old. but its ok though. As a part of a helpdesk team I'm facing the password reset problem quite regulary. Password reset disk is a good solution for single users. In big enterprise environments it's better to implement self service solutions like desktop authority password self service. Using such a tool every user can control password resets by themselves, with an easy to use web interface. All they need is to answer to several challenging questions with their secret answers. From security point of view such solutions always keep new passwords corresponding to implemented password policies. Why doesn't it have a check-question that I can answer to get my forgotten password? When I try to change password, it needs my old one! Stupid Vista! Can't it see that I am logged on by fingerprint, and therefore should not have to use the password I forgot? This was a big problem the day I wanted to lend my laptop to a colleague at work. STUPID VISTA! I Do know My Password! Actually i'm stuck with almost the same issue which is i cant log on to my account! but i do know the password! when i typed it..the keyboard was in an another language! and on LOG ON screen keyboard accepts only english language!! so i know the exact password..but i couldn't type it in the required matching language!! i hadn't created any reset disks! and i couldn't find any other way to go around it and type it in the required language! How to download a program (Password Changer, etc) to the computer when you can't download without the admin password? I can't seem to find the answer to this on the Password Changer site either. I'm not sure I understand what you mean by "can't download without the admin password". If you mean that you cannot download a file and save in directly on the "C:" drive, then you should try to download this tool and save it on your desktop or in your Documents folder. 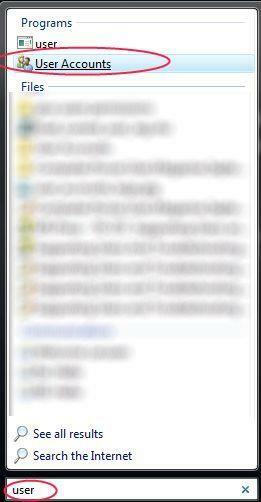 You should have permissions to save files in these two locations. Can I create reset password for two or more computers (VISTA) in a single USB clip memory or or one USB clim memory one reset disk? i bought a computer from a friend and he didnt tell me you had to have a password just to log on to the computer its self and i dont know what to do? 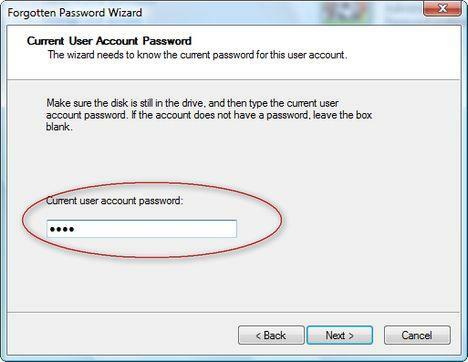 To retrieve your passwords, try this article: How to retrieve your Windows Vista password.